C++ Pocket Reference is useful to Java and C programmers making the transition to C++, or who find themselves occasionally programming in C++. The three languages are often confusingly similar. 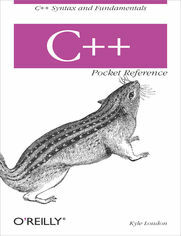 This book enables programmers familiar with C or Java to quickly come up to speed on how a particular construct or concept is implemented in C++.Together with its companion STL Pocket Reference, the C++ Pocket Reference forms one of the most concise, easily-carried, quick-references to the C++ language available.